As the federal government carries out the Executive Order to reform and restructure, leadership requirements have escalated. 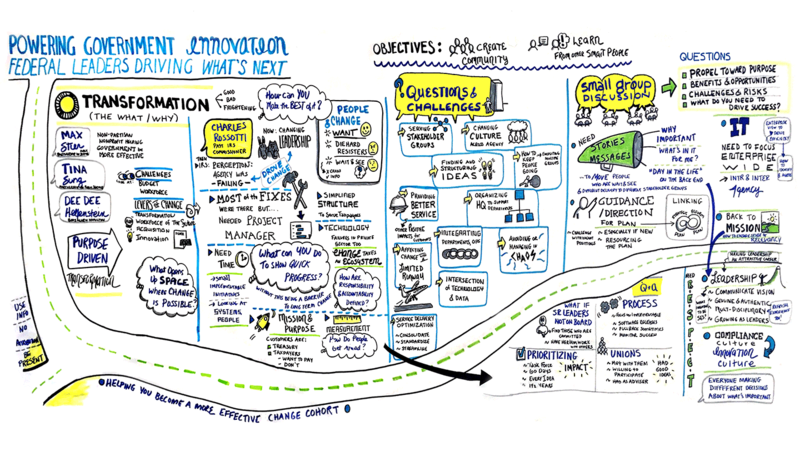 In the face of such large-scale transformation, leaders are gathering from across agencies to learn from one another—and applying shared lessons to design innovative roadmaps for change. With systemic change on the agenda for government officials, the issue of transformation is now agency-agnostic and keeps many up at night with questions: How do I create an informed transformation strategy? What are the challenges or risks that will likely surface? What does success, as opposed to perfection, look like? Now more than ever, leaders in government need to hear candidly from one another and unpack these issues collectively. That’s why Booz Allen and the Partnership for Public Service kicked off the first session of our Powering Government Innovation series in October. With such a diverse and engaged group of leaders in the room, the conversation gave way to new ideas and underscored some age-old, yet key practices. The highlight of the day was hearing from former IRS Commissioner Charles Rossotti. He shared his first-hand account from the high-profile agency overhaul he led in the late 1990s—shedding light on how he got stakeholders on board, changed course when things weren’t working, and prioritized the 5,000 recommendations for improvement that the IRS received. From his experience as commissioner, he also identified four main factors that all leaders should consider as they embark on a transformation: the force driving change, timing, technology, and change management. It’s never easy to step away from the office, reschedule meetings, and take a break from email. But as the Executive Branch carries out M-17-22, leadership requirements overall have escalated—and change managers can learn the most from their peers, no matter the agency. Booz Allen is proud to be facilitating this series, from now through June 2018, with the Partnership for Public Service. Together we are building a new community of peers from across government to fuel innovation and become agents of change. Stay tuned for re-caps from the rest of the series and visit the Partnership for Public Service page.